To continue along the lines of the Olympic references of my last post about Tampa Bay Beer Week 2014 (Mar 1-9, 2014), we had essentially two opening ceremony events spread across the first weekend with the Florida Brewers Guild (FBG) festival on Saturday March 1, and the Brewers Ball festival on March 2, two separate events providing patrons with samples of award-winning brews from Florida and beyond. From March 1-9, both sides of the Bay and north and south played host to over 300 craft beer related events, culminating in the final weekend with Hunahpu Day on March 8, and the Hunahpu Hangover/Dunedin final days on March 9. Given that parts of the world can barely make it through a full day without calamities, I’d say we live in luxury when we can celebrate the wonders of craft beer in friendships and sunshine with only a few minor mishaps along the way. I’d love to do a Gold, Silver and Bronze award across all TBBW events, but gosh, But, gosh, I only made it to a dozen events out of the hundreds scheduled during Tampa Bay Beer Week and they ranged from the huge anchor events on both weekends to small gatherings. Fri Feb 28, 2014 – Tampa – Pour House pre-TBBW party featuring over 10 taps from 7venth Sun Brewing and other local breweries (see the photos page for pics) – SILVER medal winner – a great place with great atmosphere. Only missed out on gold because there was really no EVENT aside from all of us meeting each other. Sat Mar 1, 2014 – Tampa – Florida Brewers Guild Festival – Cotanchobee Fort Brooke Park, Tampa – GOLD medal winner – Highlights included the reading of the Tampa Proclamation and tapping of a commemorative firkin by Tampa Mayor Bob Buckhorn, and a veritable gourmet assortment of delicious Florida-only brewers (see the photos page for pics) – sizable crowd but not too crowded. Having the mayor present and so many FL brewers who came from Miami to Pensacola to Jacksonville was a plus. Mon Mar 3, 2014 – Tampa – Pour House – Beer Bloggers Summit – SILVER medal winner – purely based on the size of the turnout. Quality of presentation (myself, Sean Nordquist, Gerard Walen, Thomas Barris) and Thomas Barris’ organization of the event were top-notch. Small gathering but great discussion! 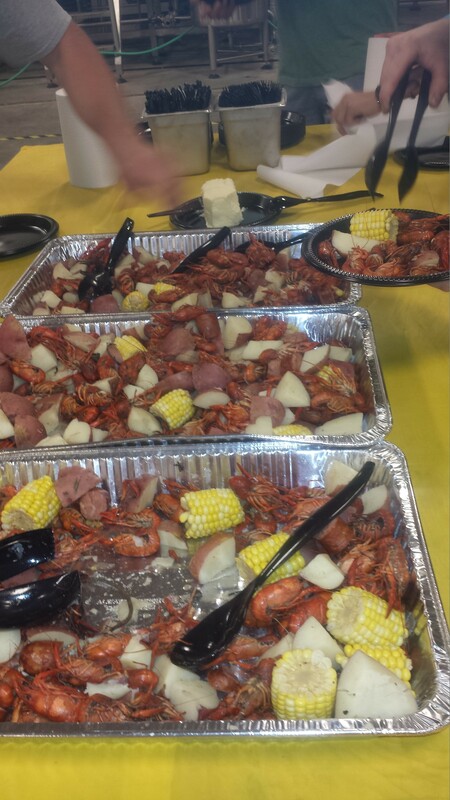 Tues Mar 4, 2014 – St Petersburg – 3 Daughters Brewing Fat Tuesday Crawfish Boil -GOLD medal winner – for a mere $30. attendees could dine on all-you-can-eat boiled fresh crawfish, potatoes, sausage, corn and free pours of two 3 Daughters Brews (Summer Blond and the IPA) with a live New Orleans style band. Wed Mar 5 2014 – Clearwater – Pair O’ Dice Brewing – Brisket and Brews- GOLD medal winner- while I arrived at Pair O’ Dice after the last morsel of brisket was already devoured, all I heard from participants was how incredibly good the food and the pairing was (and it was free!) I had a great beer, but I had to take the enthusiastic response from everyone I talked to that this was a winning event. Wed Mar 5 2014 – Seminole – Rapp Brewing – Rare Beer Night – GOLD medal winner – Greg Rapp pulled out the stops to feature not only his wide variety of local brews, but also a few absolutely rare beers for this specialty night. Again, like the Pair O’ Dice event, the tasting room was packed until late. Thurs Mar 6 2014 – Palm Harbor – Lagerhaus – Bacon, Bacon, Bacon – GOLD medal winner – along with tapping a special barrel aged brew and the multiple bacon dishes (bacon cheddar soup, bacon pretzels, bacon wrapped dates and figs to name a few) , the tasting room was packed from mid-afternoon until late. What can be better than Bacon and Beer? Sat Mar 8 2014 – Tampa – Cigar City Brewing Hunahpu Day – SILVER medal winner -this would be a hands-down GOLD medal winner if the crowds had been manageable, this was a 3 in one event: Hunahpu release + bottle sharing (complete with a makeshift attendee organized campground) + beer tasting. Just one event of the three (any one) would be GOLDEN. Sun Mar 9 2014 – Dunedin – Hunahpu Hangover Day – featuring 7venth Sun and Dunedin Brewery – GOLD medal winner – special releases in the side garden area of 7venth Sun (it was packed) and in Dunedin Brewery – the sun shone, the brews were innovative, and the air was celebratory. Grand cooperation! Your turn – what were your medal events? 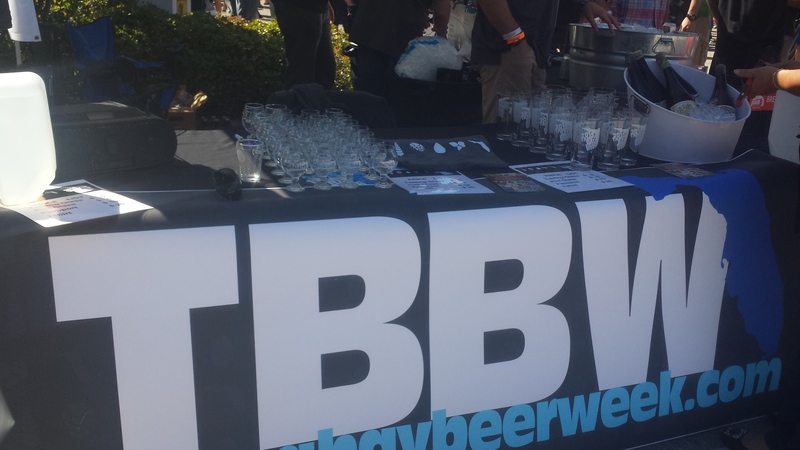 I can’t wait for the events in planning for the rest of this year (at a minimum our TBBW Halfway There – Rare Beer Fest scheduled for September 6, 2014) – Tampa Bay Beer Week continues to thrive, grow and spillover into multiple weeks of the year. It is a great community of vibrant, positive, optimistic Floridians. Long live Tampa Bay Beer Week! Happy St Patrick’s Day – be safe! this could actually become an obsession! At the Southern Tier Brewing Company, vigorously hopped beer is our standard and inspiration. We continue a commitment to innovation with our most aggressive offering yet. Unearthly is a manifestation of the brewer’s craft; skillfully balancing art and the forces of nature to produce a divine liquid. Delicately pour a taste into a fluted glass. Smell the enchanting aromas of the hops waft forward as your first sip divulges this beer’s fervent soul. To underestimate Unearthly is to trifle with the mysteries of the universe, so please consume wisely. High in the winter sky, two parallel stick figures are visible & known as “the twins,” or the constellation Gemini. The astronauts of the 1960s flew as teams of two in a program named after the celestial pairing. At Southern Tier, we have our own fraternal twins, Hoppe & Unearthly. Blended together & placed in this vessel, the mission of our Gemini is to travel high & take passengers on a journey far into the heavens. The hexagram talisman has been used around the world for centuries to invoke magic and good luck. The six–point star is also the customary symbol of the brewer, representing the essential aspects of purity: water, hops, grain, malt, yeast, and of course, the brewer. Wishes of good fortune often collaborate with the brewer’s creativity to yield dramatic results. We carefully chose the name for this Imperial India Black Ale, Iniquity – a word opposing goodness. Why? This beer is contrary to what one may expect from an IPA; this is an ale as black as night. It is the antithesis of Unearthly. Some may consider it an immoral act to blacken an ale. We suggest they don’t rely on conventional standards. Allow the darkness to consume you. Cheers! If you have the luxury and good fortune of finding one of these seasonal Southern Tier offerings on tap in your area, let me know if you agree with my choice of my new love. p.s., The Downtown location of World of Beer (St Petersburg) told me tonight that Southern Tier Brewing is having a special evening at their site in March 2012… can’t wait to find out the date ! This weekend’s Gasparilla International Film Festival (GIFF) in Tampa, FL features some great media events, including the Friday evening screening of the film “You” featuring actress Melora Hardin with a pre-screening party at the Tampa Bay Brewing Company in Ybor City (on the east side of Tampa). Tampa Bay Brewing Company has been a longtime favorite of mine and is one of the best craft breweries in FL. I’ve never seen draft beers from Tampa Bay Brewing Company at any other bars in the area so I can only surmise that they keep their microbrews (about 10-15 at any given time) for patrons at their on-site restaurant. I had the opportunity to sample a few of the brews recently along with their two seasonal brews – one a double red head amber (more like a bitter in many ways) the other a heavy IPA – and settled on their Warthog Heifeweisen which the menu truthfully cast as having a slight after-taste of banana and cloves. Cloudy and definitely wheaty (no surprise here) and the banana was almost indecipherable unless you already knew about it. If you happen to be down in FL this weekend (Mar 19-21, 2010) be sure to check out the Gasparilla International Film Festival and the Tampa Bay Brewing Company. I’m counting on the weather to be balmy and (hopefully) back to the seasonal warmth that we’ve sorely missed this winter! Say hello if you happen to be in the area! However, I think a new tradition for those who don’t love the taste of Guinness (the most Irish beer going as far as I’m concerned) could be to ease into Guinness half-heartedly (so to speak) by having a Guinness-blended concoction this shamrock day! Dirty Guinness – 1/2 Guinness on the floor (LOL) – this is usually an end-of-night drink for some! Let me know what you think – and hey, luck of the Irish to you all this St. Patrick’s Day!